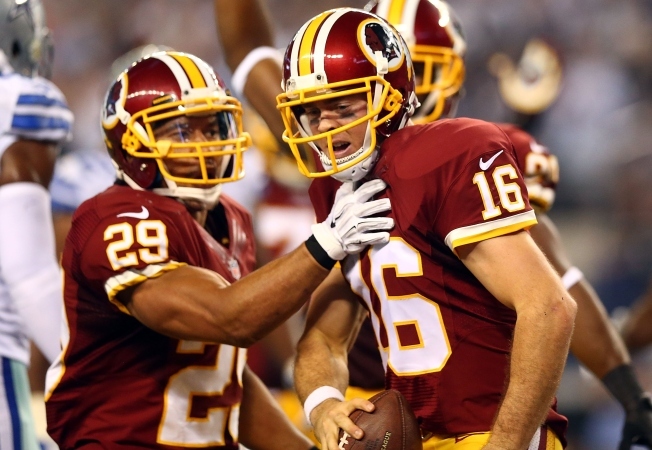 Let's be honest: it seemed highly unlikely that the Redskins would defeat the Cowboys on Monday. Washington entered the game against 6-1 Dallas having lost eight straight divisional games (the longest active streak in the NFL), seven straight primetime games and 15 of its past 19 appearances on Monday Night Football. The Redskins were starting a quarterback, Colt McCoy, that was 6-15 as a starter, the third-worst winning percentage among active quarterbacks. Including the Redskins' 19-17 victory against the Titans last week, McCoy has completed 36 of his 42 passes with an average of 10.2 yards per pass. According to Elias Sports Bureau, no quarterback has ever completed at least 80 percent of his passes and averaged 10 yards per completion in his first two games with a team. He is also just one of two quarterbacks over the past 10 years to lead a game-winning drive in the fourth quarter or overtime in his first two games with a team. Coincidentally, McCoy's last appearance at AT&T Stadium -- a 13-12 win with Texas against Nebraska in the 2009 Big 12 championship game -- also featured late-game heroics. "Last-second wins, right?" McCoy joked according to AP. "But I grew up as the game went on. I felt more and more comfortable, and I started seeing the defense right. We made some plays down the stretch that good teams have to make to win games." McCoy's spirited performances will surely lead some to clamor for him to remain the starter for the rest of the season. Those who feel that way will need to slow their roll. "[Robert Griffin III's] our starter," coach Jay Gruden told reporters. "I haven't wavered off of that in my mind. When he's ready, he'll be ready to go." Regardless, savor the moment. Dallas Week was a surprising success.